Love is a taboo, a mere fantasy— foreign, unreachable, and dangerous. Raised in a society where women have no rights, seventeen-year-old Thia Clay holds little hope for a bright future. When her parents sell her into marriage to elite member William Fox, Thia slowly gives in to despair. 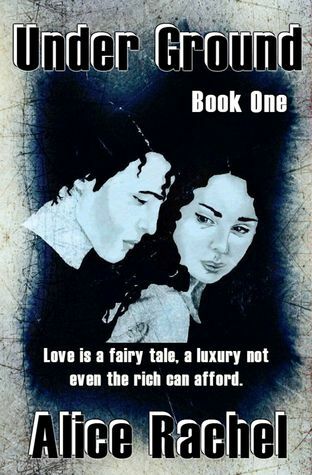 William is nothing but a cruel, selfish young man with no other interest than to serve his own. If caught in their forbidden relationship, Thia and Chi could face a death sentence, and when devastating secrets surface from Chi’s past, Thia has to rely on her instincts to make a choice that could save her or destroy her forever. Grab your copy now for FREE! “During the meeting, only speak when spoken to and don’t ask any questions,” Mother snaps at me coldly. “Yes, Mother.” I roll my eyes. Why does she have to remind me to be quiet? I’m only allowed to talk when someone addresses me, and questions from me are never welcome. This situation will no different from any other circumstance in my life. I want to grunt something back at her, but I swallow the snide remark quickly and try my best to look obedient. “Don’t look at William too insistently. Don’t say anything stupid that could make him or his family feel uncomfortable.” She keeps going on and on with her demands. Mother has been instructing me in proper manners for years; it’s hard to focus on her words. In one week, William’s family will come to our house for our official meeting—a crucial reunion that will finalize our engagement or break it apart. His parents will gauge whether I’m still worthy of their son or not. Mother is anxious, worried I might make a fool of myself. There are just a few bullet trains in New York State, all of them reserved for the upper-class. They ride through the mountains, between the different towns, and into the metropolis, Eboracum City, where Mother is taking me to try on my bridal gown. As if that family needs any more money. I grit my teeth and inhale deeply. I was promised to William exactly four years ago, on the day I turned thirteen. That’s when I became a piece of merchandise sold in a trade to benefit my parents. My marriage to William was settled by our two families. I had no say in it; nobody cares how I feel about the whole arrangement anyway. Mother sends me a quick glance. A lot remains to be done before the union is complete, and this upcoming ceremony has put her completely on edge, turning the past few months into a real nightmare. “Your father holds high hopes for this union, Thia. Once you are married to William, your father will get promoted to a higher paying job. Mr. Fox even mentioned the possibility of a whole new career. If we are lucky, he will hire your father to work in his company. 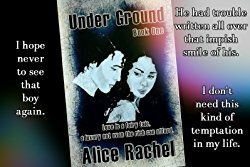 Alice Rachel is the author of the YA Forbidden Romance/ Dystopian Romance Series "Under Ground."